Seemed like it liked the lead to be a little hotter and keep the mold hotter as well. I had Pancake breakfast this morning back in the Sugar bush with an old bullet maker. I mentioned the aluminum mold vs brass and he said that once you figure out the rhythm and timing then you won't notice the change much. I have to make up a batch of .58 Minies with my brass mold soon. I hope they'll fly better than the ones I bought. Last edited by MikePal; April 6th, 2019 at 10:46 AM. 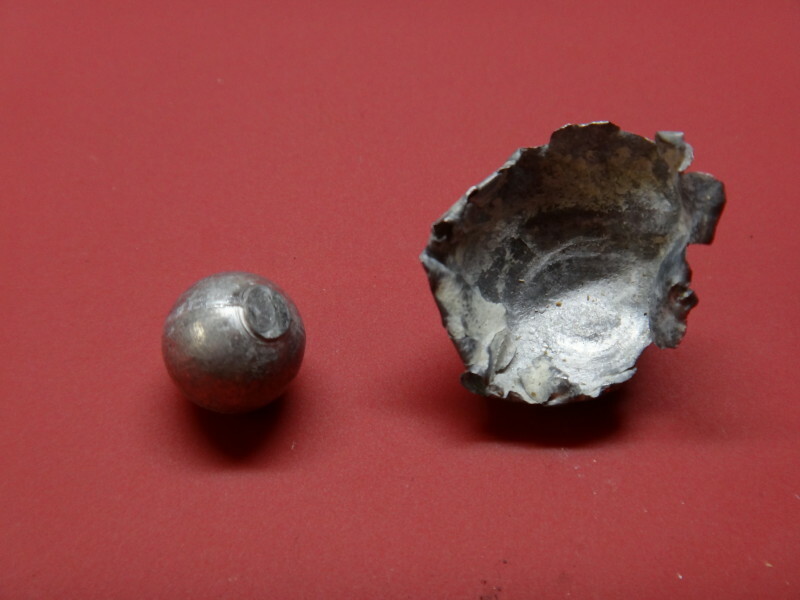 Recovered one of the .45 balls after it dented the propane tank at 100yd....it's amazing the amount of deformation the soft lead goes thru even with the energy curve diminished. Last edited by MikePal; April 9th, 2019 at 06:11 AM. Wow Mike, looks like there is lots of energy left at 100 yds. 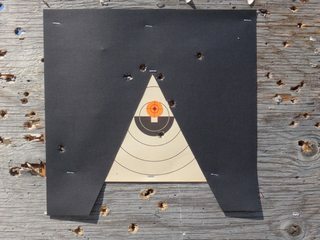 I tried something new today to sight on targets with front beads and open sights. I have to wear glasses for shooting now and it's a problem trying to see thru the top extreme left hand corner of the lens and still see the target clearly. Unfortunately it doesn't work well and for the most part I'm shooting blind at a target that is behind the bead. 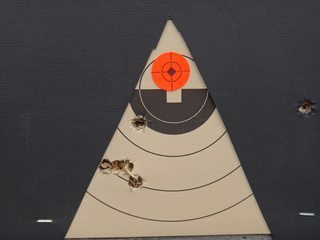 So I cut a Pyramid type contrast and laid it over the target, so now I can raise the front bead till it touches the sides just below the peak. Allows me to see both the front bead and bracket the target at the same time. Makes a far more consistent point of aim. This was the first try this aft and I'm pleased, Still haven't found the ideal load for this rifle, this was 50 gr of FFFg Goex and is getting closer to what I'm after..
Last edited by MikePal; April 12th, 2019 at 12:52 PM. Your right, having a smoking good time !! I've exploded thru almost 2 lbs of powder in the past couple of weeks figuring out the Maxi Ball conical and Patch/Ball loads. 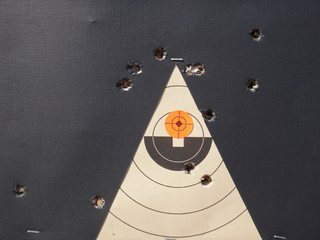 I should have the load for the sabot/ball figured out in the next couple of days now that I have a more consistent point of aim. I'm Happy with this new way of aiming...much better sight picture and easier to hold the point of aim. I was shooting high yesterday so I lowered it ..but a tad to much. 40 gr of FFFg Goex. That looks like a good idea. I think I would try the V at the top. Most of my rifles are sighted 2.5” high at 100 yd. Cant wait to shoot the muzzleloader. Last edited by Deer Hunter; April 12th, 2019 at 04:44 PM.